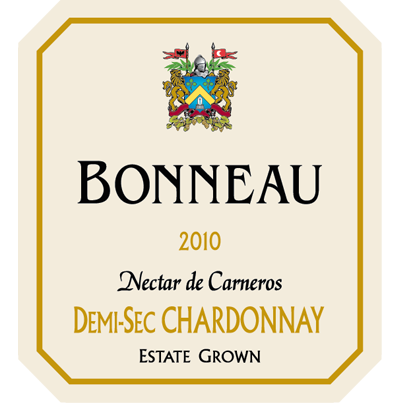 The grapes for Bonneau, Estate Grown, Demi-Sec Chardonnay were harvested late in the season at 25.5 Brix, the resulting wine has a residual sugar of 4.5 % at 11.5% alcohol. This very unique wine was made without any additional malolactic fermentation in stainless steel tanks to retain its freshness then bottled in early 2011 in order to capture the bright aromas of apricots, peaches, stone-fruits & orange blossoms. This wine was modeled after the great Vouvray from Loire, France. The texture is light and refreshing with flavors of white peach, ripe pears, & honey. There is a long pleasant finish with just the right amount of acidity for perfect balance. Please enjoy this wine as an aperitif, with spicy Asian food, or with almost any dessert.